The Project: University of Colorado Boulder (CU Boulder) leaders sought to build an open and welcoming new facility for students and staff to dine, gather, and collaborate. Based on actual student survey input, the new facility would have to showcase the stunning views of campus and the Rocky Mountains beyond, including the famous Boulder Flatirons. 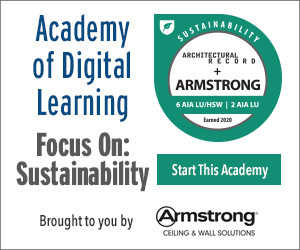 Energy efficiency and sustainable building practices were also high on the list of student-driven requirements. The Design: Showcasing the outdoor views would require abundant amounts of glass to be incorporated into the facility design, which presented a challenge for project architects. They had to find a way to control the glare and sunlight infiltration that could otherwise compromise indoor comfort and increase energy consumption due to solar heat gain. The state-of-the-art building also incorporates a host of advanced sustainability features, including sensor-detecting HVAC systems to optimize performance and native plants that reduce irrigation requirements. A bio-digester also converts food waste to be safely added to the wastewater supply. The Fenestration: CU Boulder and KSQ Architects ultimately chose to incorporate electronically tintable dynamic glazing into the new Village Center Dining and Community Commons. The selected glass automatically tints and clears based on sun intensity to maximize natural light, delivering unobstructed outdoor views at all hours while preventing glare and overheating indoors—with no shades or blinds required. The dynamic glass helps to create a comfortable, collaborative environment for students to dine, study, relax, and work together on projects. 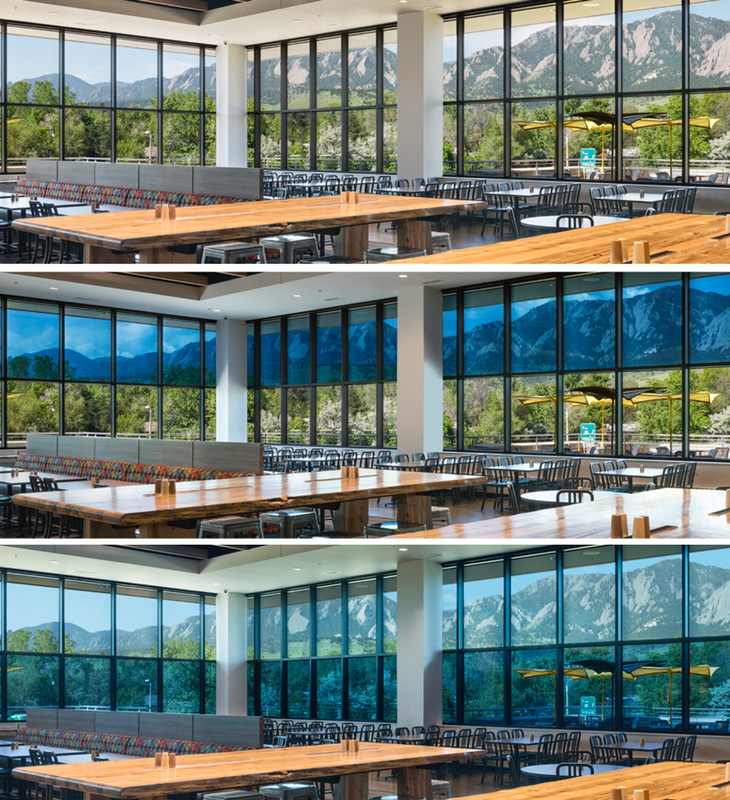 Dynamic glazing installed at UC Boulder’s Village Center Dining and Community Commons creates an energizing, sustainable environment while maintaining a clear view to the Flatiron Mountains. Shown here in three different tint zones, students and faculty can always experience the ideal balance between comfort and daylighting. 1“Applying Wellness Principles to Residential Construction.” NeoCon. June 2018. 2Browning, Bill. “The Economics of Biophilia: Why designing with nature in mind makes financial sense.” Terrapin Bright Green. 2014. Web. 8 January 2019. 3Circadian Rhythms. National Institute of General Medical Sciences. Web. 8 January 2019. 4Alice, Walton. “Your Body’s Internal Clock and How It Affects Your Overall Health.” The Atlantic. 20 March 2012. Web. 8 January 2019. 5Ford, Bob. “Harnessing the Power of Natural Light.” Work Design Magazine. 24 May 2017. Web. 8 January 2019. 6Joshi, Sumedha. “The sick building syndrome.” Indiana Journal of Occupational & Environmental Medicine. August 2008. Web. 8 January 2019. 7Grabar, Henry. “Welcome to the permanent dusk: Sunlight in cities is an endangered species.” Salon. 20 April 2014. Web. 8 January 2019. 8“Applying Wellness Principles to Residential Construction.” NeoCon. June 2018. Every Marvin Modern product works together as part of a visual system to help you design and configure with ease and confidence. Consistent profiles across all products—along with special innovations like our integrated mull channel—maintain the narrow and clean sightlines central to modern design. NanaWall redefined the category of opening glass walls. By combining precision engineering and hundreds of options, we offer design possibilities beyond the conventional for almost any space. SageGlass HarmonyTM is a unique glazing solution for designers seeking to enhance the occupant experience by maximizing visual and thermal comfort. While traditional solar management solutions compromise aesthetics and impede views, Harmony dynamic glass provides daylight, heat, and glare management while maintaining a natural and seamless connection to the outdoors.